The reunited Connor clan realise that the group targeting them is about to target Savannah Weaver. Meanwhile James Ellison finds himself under pressure once again. 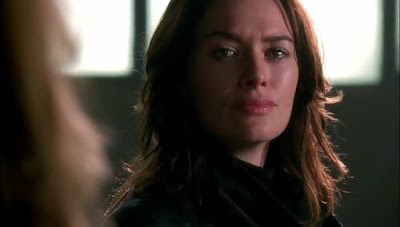 The episode opens with Sarah, Derek, John and Cameron meeting at a graveyard, the graveyard that Kyle Reese is buried at. John informs the group that he found a phone on one of his attackers. On the phone was a picture of Savannah Weaver, who he recognised from Dr Sherman’s office. The group go off to find her. At home Savannah is talking to John Henry when a T-888 arrives to kill her. While John Henry attempts to lead her to safety, John and friends arrive to save her. While they are escaping however Derek is shot in the head and killed. How you kill off a regular character is always a problem. You don’t want to make it too big a deal or it will come across as breaking reality At the same time you don’t want it to feel like how any other death would feel on the show. Unfortunately I feel that the killing of Derek fits more closely to that second camp. Derek is walking down a corridor and he is suddenly shot, that’s it. Killing him off so quickly and in such a throwaway way is shocking but doesn’t leave you with much aside from a momentary shock. 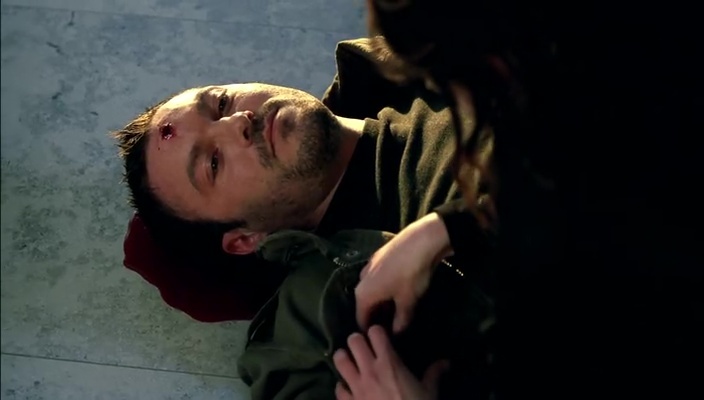 Death is such a commonplace element of ‘Terminator:TSCC’ that Derek’s death just feels like one more to add to the pile. With Judgement Day looming Derek’s, comparatively worthless, life can’t be made to have much emphasis but just a little more weight could have been added without ruining the overall tone. Back at Zeira Corp, the police, including a difficult FBI agent, have arrived to help with the abduction of Savannah. Catherine gives James the job of questioning John Henry. In the basement John Henry has been watching the security footage of Weaver’s house and has correctly identified Sarah Connor in the footage. 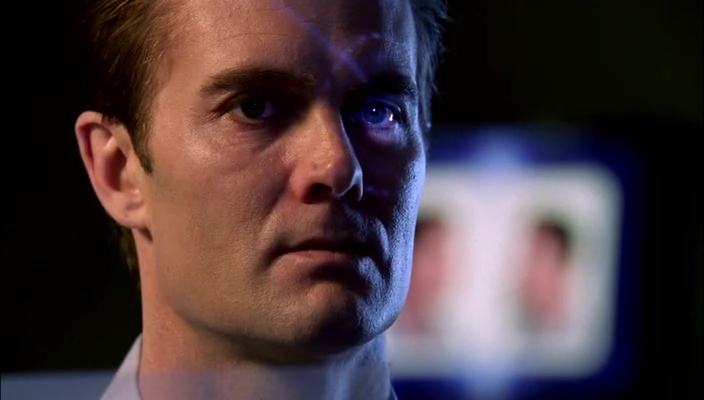 Henry questions Ellison on why he lied about the death of Sarah Connor and why he continues to do so. Ellison says he is doing it to save Savannah as quickly as possible and that he needs to deal with Sarah alone. 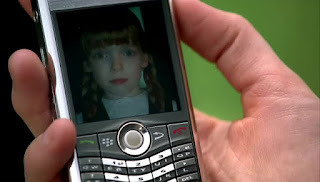 Ellison manages to negotiate to meet Sarah and later persuades Catherine to meet with Sarah also in exchange for her daughter. However during this process Savannah mentions John Henry to John Connor, who manages to figure out exactly what Zeira Corp is keeping in their basement. Sarah is angry but wants the deal to go through as planned. At the agreed transfer point, a cinema, Savannah is given to Ellison. 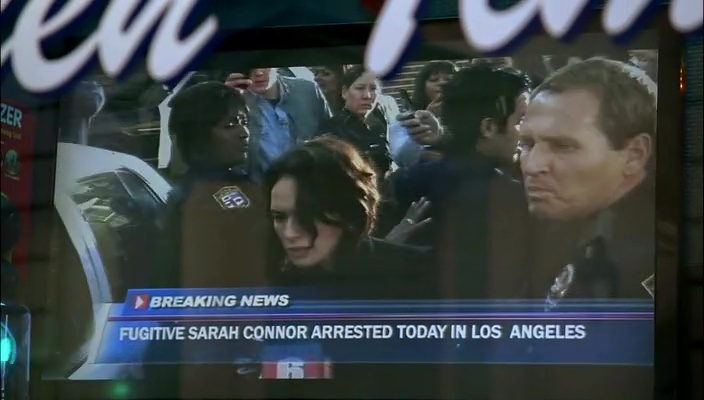 Upon Sarah leaving the cinema she is arrested however, the police set a trap for her. Sarah is cuffed and led away while John, Cameron and Ellison watch powerlessly. Ellison swears to John that he had nothing to do with the ambush but John swears revenge on him before escaping. 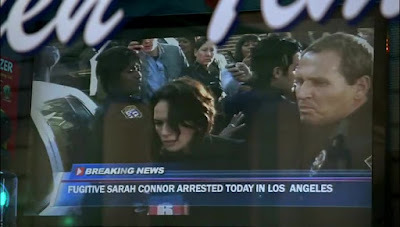 We end the episode with John and Cameron watching the news report on Sarah Connor’s arrest while Derek’s ashes are being buried in the same graveyard as his brother. So ‘Adam Raised a Cain’ is obviously very dramatic. That is what you’d expect from the penultimate episode of a show such as this. With Derek’s death and Sarah’s arrest things seem bleak for John Connor but we leave the episode feeling that he has already planned his next move. Will he head for Zeira Corp for a showdown with John Henry or go the police station to rescue Sarah, or maybe both? Derek’s death at the hands of a T-888 and Sarah's arrest at the hands of human authorities perfectly reflect the two forces that the Connors have to fight against to survive. The remaining running time of a single length episode doesn’t seem enough to wrap us this story, that’s my concern at this point. However none of the 30 episodes so far of ‘Terminator:TSCC’, including this one, have truly disappointed me. Will the final episode be one last hurrah or the final nail in the coffin of a doomed show? I look forward to finding out.